A monthly e-newsletter highlighting Palm Beach Philanthropy Tank's impact in the community, upcoming events, and volunteer opportunities. 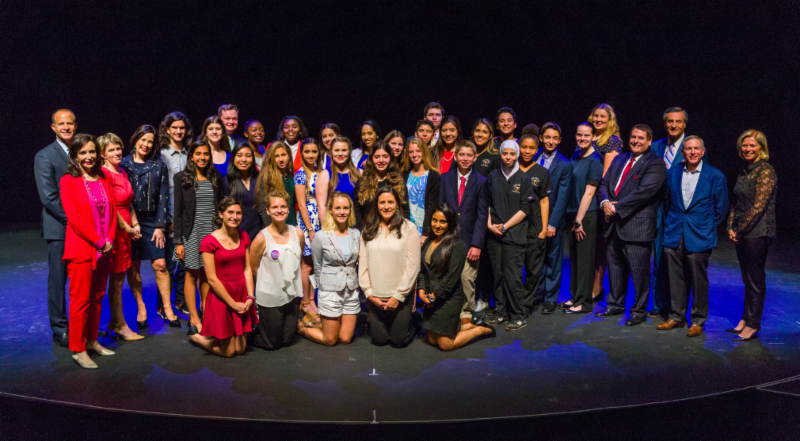 More than 400 parents, students and supporters attended the second annual Palm Beach Philanthropy Tank Finals Event on March 8, 2017 at the Maltz Jupiter Theatre. The nine Student-Finalist teams did an outstanding job “live-pitching” their programs/project ideas, and collectively received $100,000. The prize money will be used to implement their programs over the next year as they work closely with their Philanthropist-Investor(s). 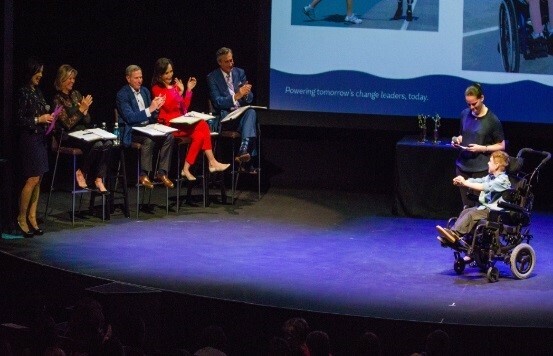 The adrenaline-filled evening was felt among the crowd, too, thanks to the help of our emcee, Sally Lou Loveman, former audience producer for “The Oprah Winfrey Show” and “Oprah’s Lifeclass” for OWN. 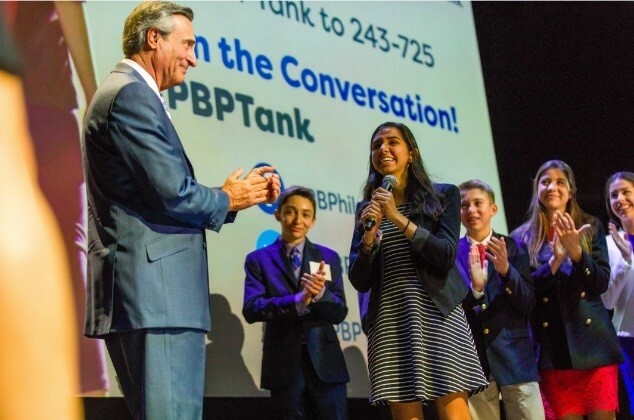 During the Philanthropist-Investors deliberation break, Loveman got the audience involved in raising funds to support PBPTank. The goal of $10,000 was surpassed, with more than $15,000 raised in donations made from the enthusiastic and supportive crowd. 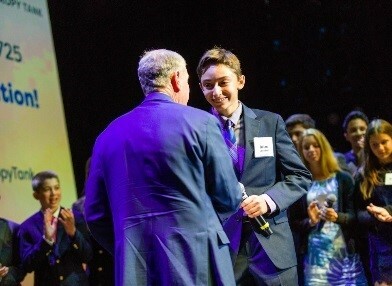 The overwhelming success of our 2017 event would not have been possible without the support (and generous funding) of our sponsors and Philanthropist-Investors: Julie Fisher Cummings, Bill Meyer, Avy Stein and Christine Stiller. Partners: Advisors for Philanthropic Impact (API), Community Foundation for Palm Beach and Martin Counties, Education Foundation of Palm Beach County and Maltz Jupiter Theatre. We’d also like to recognize everyone who couldn’t join us in-person but watched via Facebook Live. Our Facebook Live stream videos were viewed over 9,000 times! Thank you to all involved in Palm Beach Philanthropy Tank 2017. 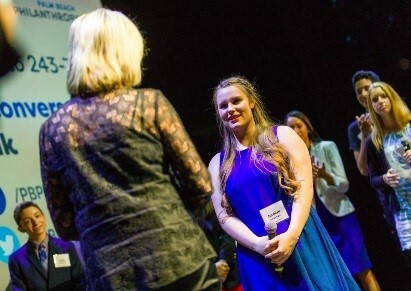 Stay in touch and follow the progress of the 2017 Student-Finalists by visiting our website . Each of the 2017 Student-Finalists will be making a positive impact in our community. Check out the complete list of programs and projects being funded this year. Pitch: Working with The Miracle League of Palm Beach County to develop an unrestricted, boundless, and inclusive playground and garden area. Pitch: Providing eye screenings to Head Start programs, children ages two to four, using a Welch Allen Camera to detect eye problems early on. Pitch: Providing hospitalized children with a visit from their favorite characters along with care packages to help make hard times a little easier. Pitch: Expanding the existing Horses that Help program, which uses horses to break through physical, mental, spiritual, emotional, and cultural barriers to “at risk” youth. Pitch: Installing sunscreen dispensers in Palm Beach County parks, and later in public schools, to empower peers and members of the community to make critical sun-safe choices for healthy living. Pitch: Partnering with the YMCA to purchase iPads for use at afterschool programs to improve reading skills. Pitch: Providing fresh produce to food-insecure individuals and families in Palm Beach County. 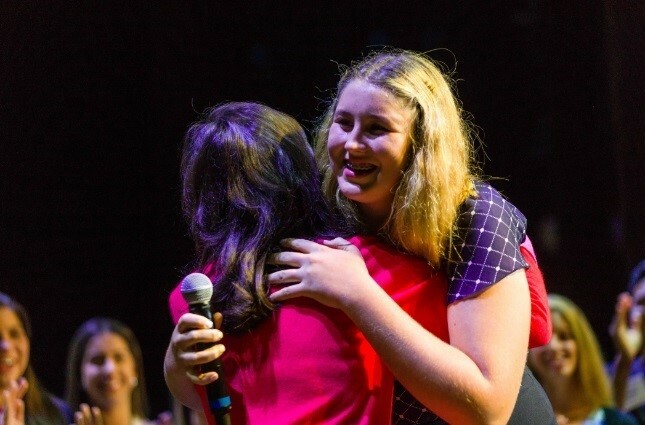 Pitch: Engaging, connecting, and empowering middle school students to reach their full potential through mentorship and tutoring by high school students in the Delray Beach community. On May 17, 2017 , from midnight to midnight, Palm Beach Philanthropy Tank is participating in the Great Give Palm Beach & Martin Counties, a 24-hour online giving event led by the United Way of Palm Beach County, Achieve, Nonprofits First and United Way of Martin County. Great Give 2017 is designed to raise as much money as possible for local nonprofits in just one day and we will need your help! For a minimum of just a $20 dollars you can help to support our organization during this 24 hours of giving. All you have to do to donate is click on this link on May 17th. As we geared up for the Finals Event, our Executive Director, January Romero Reissman visited WPBF (local ABC affiliate) to give an overview of this year’s Student-Finalists’ ideas and encourage the public to join us and support the program! A big thank you to WPBF for having us on the show! The Palm Beach Post helped drum up some excitement for the Finals Event in the days leading up to the big night! It’s always great to see the local media supporting our youth and a great organization (like ours!). 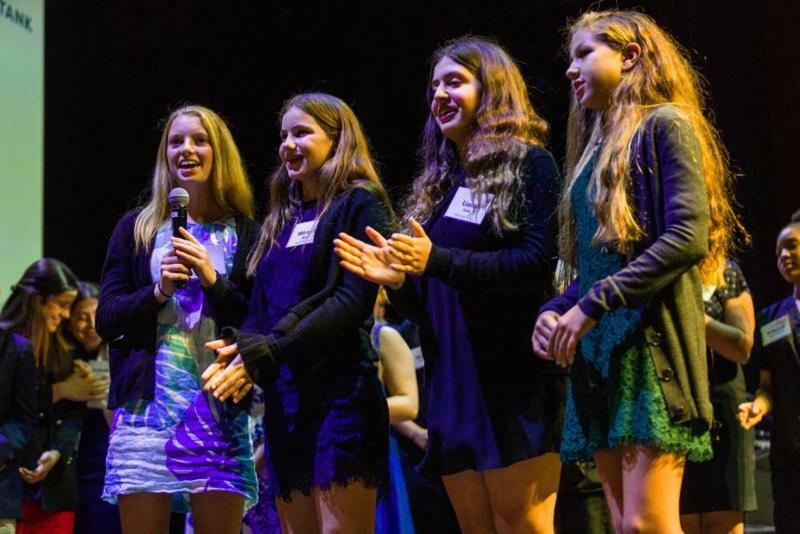 Team Y Not Read from Palm Beach Day Academy was highlighted in the story as one of the nine finalists scheduled to compete on March 8. Y Not Read took home $9,000 to purchase iPads for afterschool programs at the YMCA to improve reading skills. We provided a short video clip of the Finals Event to the local television stations that were unable to attend. WPBF was excited to report an update on the Student-Finalists since January Romero Reissman was in-studio just a couple days before. Visit our website and follow our social channels for announcements about next year’s event. We are so grateful for your support of this amazing program. Thank you!